Now that I have placemats and a table topper, it was time to take a look at the tablescaping stuff and see what I could pull together in a different way. I wanted to shop my own closet this time. Amazingly, I didn’t buy one single thing, all of this came from my stash. I know DH will be happy to hear that, LOL!! So, when we finished yesterday, I had the table ready to go with the Colors of August Placemats and the Colors of August Improv Topper. Note that the theme is the month of August, not Autumn. From the fall bins came orange chargers that I found at a thrift store last year. 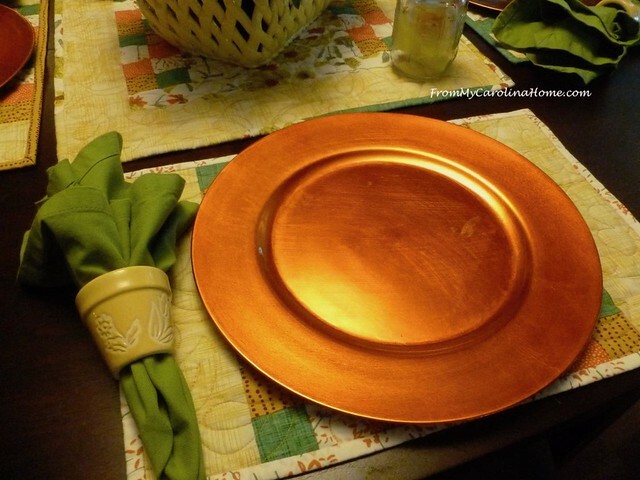 Spring green napkins have yellow flower pot napkin rings. White dinner plates are topped with my lemon salad plates. I haven’t used these yet this year, so a great time to bring them out. 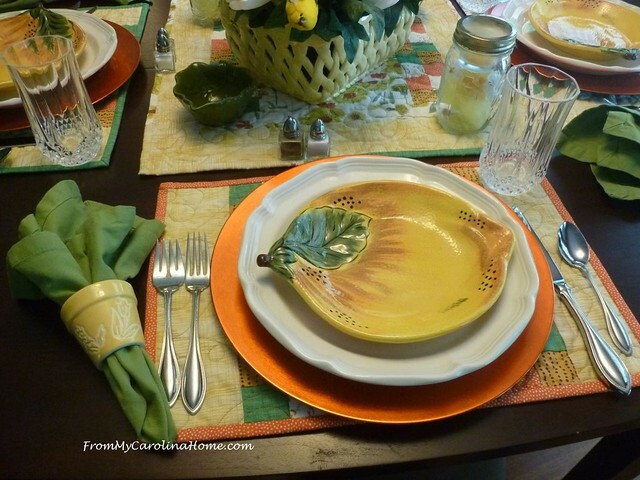 They have the yellow and a bit of green that goes well with the colors in the linens. Looking back, it had been quite a while since I showed them on the blog in my Spring Cookout Blue and Yellow Tablescape, and then at the end of summer with a Late Summer Cookout. 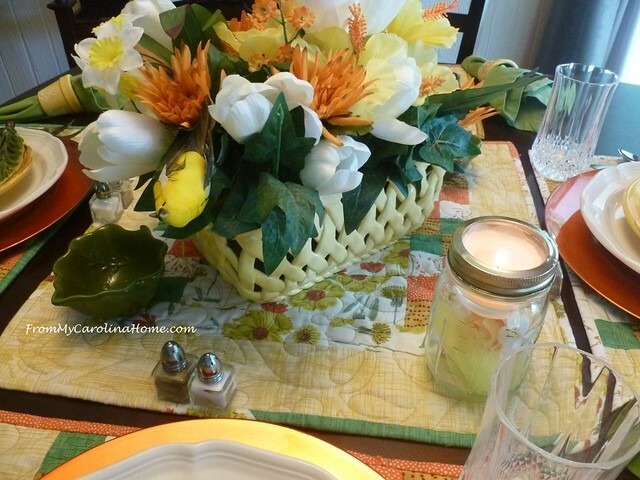 For the centerpiece, my yellow ceramic basket was already loaded up with yellow and white silk flowers from a spring arrangement. 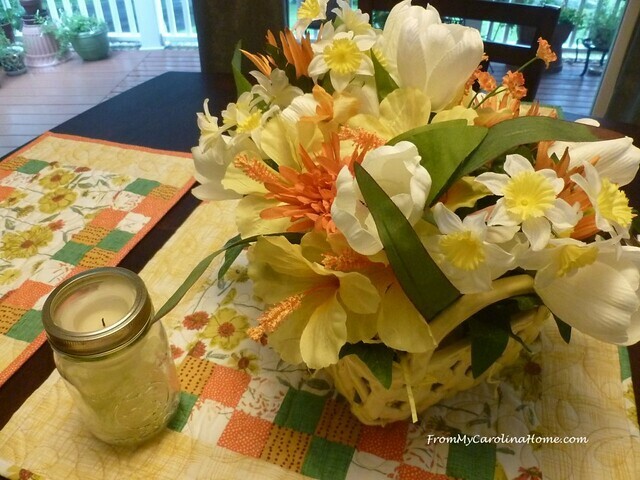 All I needed to do was dig out some orange flowers from the big bag of silk flowers and add those to the arrangement. I added a few more green leaves too. Starting to come together. A couple of small leaf dishes were added to the center to finish off the center. Every day flatware is used for this everyday table. Next, I added the mason jar candles. I’ve shown these before, but for new readers here is how I do those. 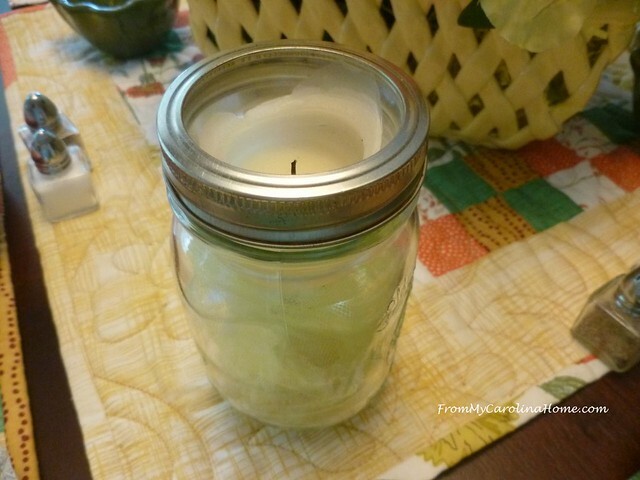 I found that the little flared votive candle holders will fit the top of a medium size mason jar purely by accident one day while shopping at a big box crafting store. The votives were just around the corner from the jars, and on an impulse I decided to see if one would fit. 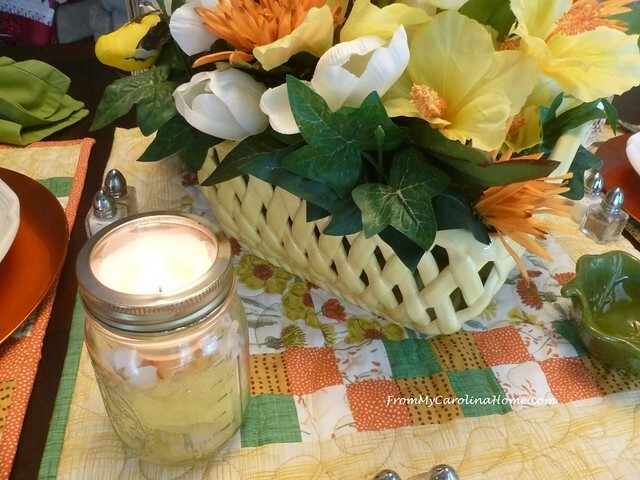 Fill the bottom of the jar with items that coordinate with your table setting, in this case I used a bit of tulle and a silk yellow rose. Sit the candle on top. Replace the metal ring to hold it all together. It looks nice with the candle lit. I use unscented ones on the table so it won’t interfere with the delicious aroma of my meal. So many readers talked about peaches in August, and I have two recipes for Peach Coffee Cake using fresh peaches and cinnamon on the blog. My original one is HERE. I made a mistake and bought self rising flour at the store, but didn’t realize this until already had my peaches ready to go. So, I have a second version using the self rising flour HERE. This year the bears got my peaches, so I got some at the orchard last Saturday. Anyway, back to the table, I added glasses and the individual salt and pepper shakers to each setting. All set, we have been enjoying this table for meals for a few days now. 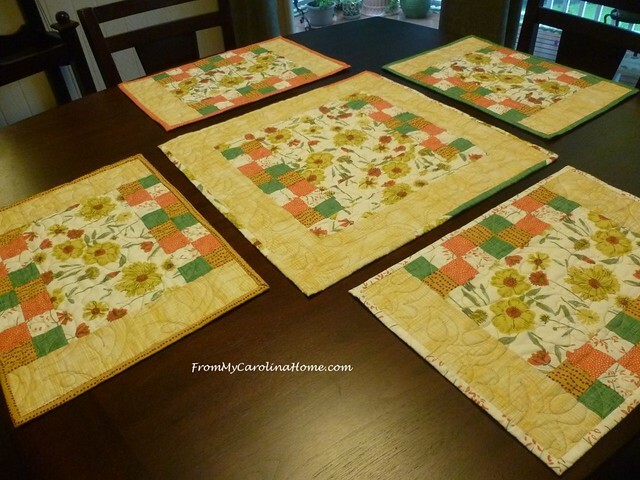 The winner of the August Blogger Bundle is Quiltmouse who commented “Making placemats for our table has long been on my ‘gotta do list’ and I love autumn colors. Your placemats look like the perfect project to get my sewing mojo back after several months of caregiving. Thank you for the opportunity to win the fabric bundle.” Maybe she can get started with the FQ bundle! Congratulations! What do you set on your August table? Check out today’s Flash Sale at Fat Quarter Shop! Find Lemon Accents for your table on Amazon. On Craftsy, FREE 7 Day Bluprint Trial Turn your inspiration into action. I love the yellow, orange and green! It looks very fresh and inviting. The plates are very pretty! I can imagine that breakfast pastry or a summer salad at that pretty table. I hope the bears enjoyed those peaches! I guess the sacrificial peaches kept the bears happy, and hopefully out of trouble. Very pretty! 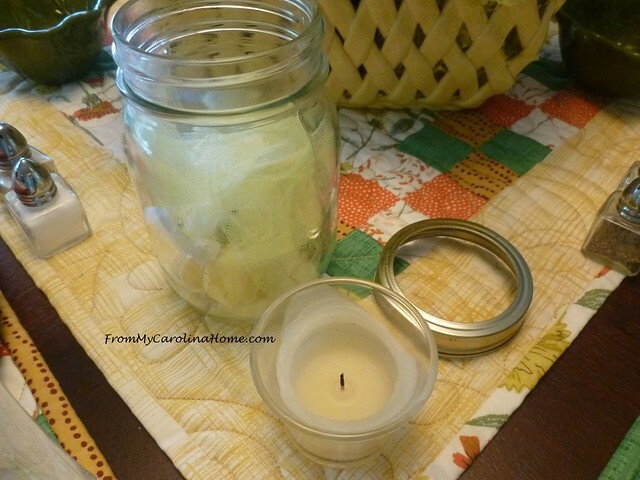 And love the mason jar candle idea…I was at someone’s house a while back and she had a similar setup with dried beans in the bottom part…sort of layered in different colors. Very attractive, and would add some nice weight to keep from falling over, right? How it turns out. Have a great day. Congratulations, Quiltmouse! 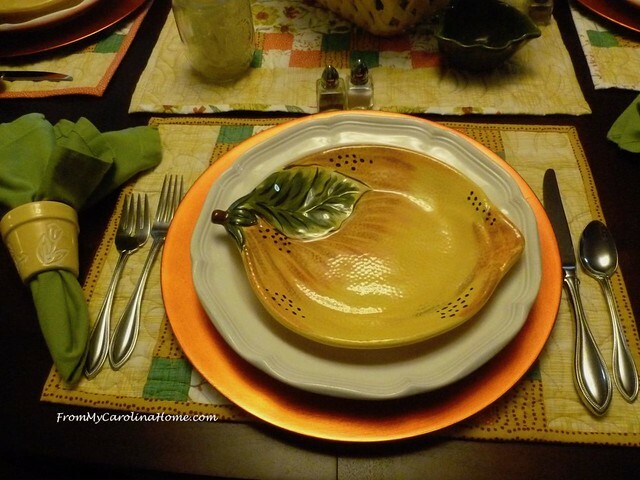 I love the lemon plates, Carole, great table! Such a pretty tablescape! You have so many pretty dishes. Congratulations to Quiltmouse! 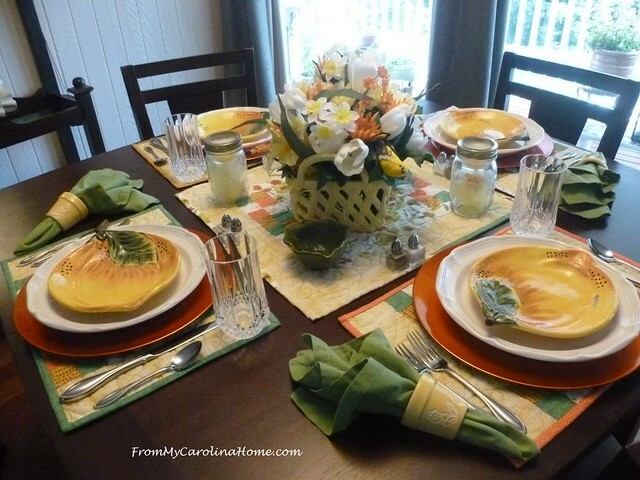 Very pretty Carole….so inviting and you did a great job with your placemats. love them. So pretty! I never had completely set my table, but always a centerpiece and cloth. This house too small for them, and the table has become a dumping ground. Plus DIL has cats who have the run of the place when no one is at home to shoo them off! so I bought a vinyl cover for the tablecloth that is on all the time now. Last year I had the lovely Pilgrim man and woman I bought off eBay after I saw yours, and they knocked one over, so she has a glued back on basket. Sigh…. Very pretty Carole, you are so inspiring. You did a beautiful job! I was anxious to see your tablescape and I was not disappointed! Carole, Such a gorgeous table. I love the flower pot napkin rings! 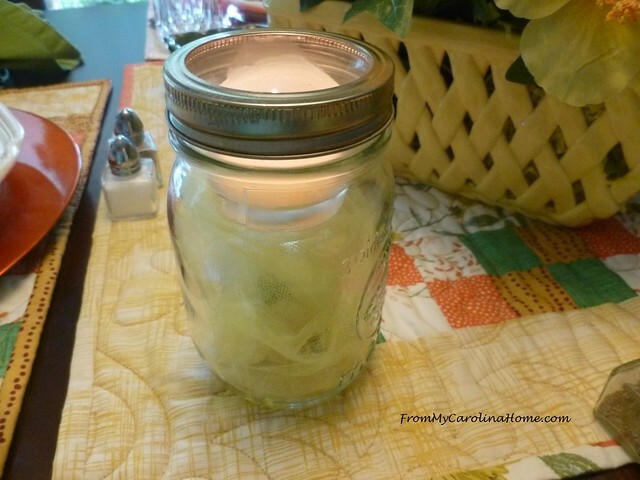 Also thank you for sharing the mason jar candles. 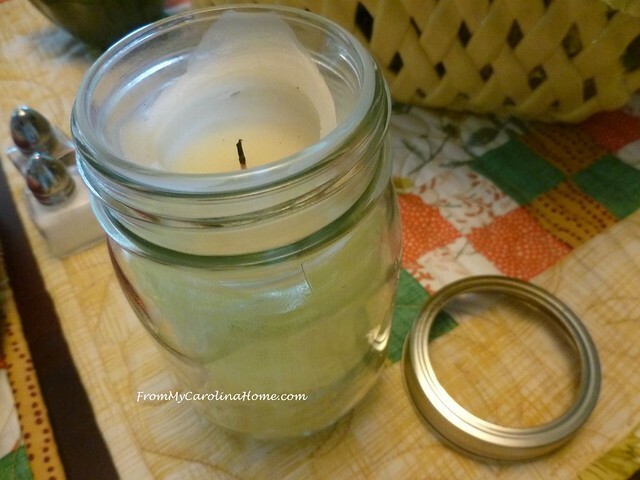 I have the same votive holders and about a billion mason jars so I am going to try this. Really cute! Table art! Your tablescapes are always amazing. Thank you, Thank you, Thank you! I was just notified that my prize bundle has already shipped. I cannot wait to be able to get started on my placemats! Love reading your blog. You share a lot of different things which keeps it interesting! Happy Stitching!! Your tablescapes never fail to delight me. A special setting for the end of summer. 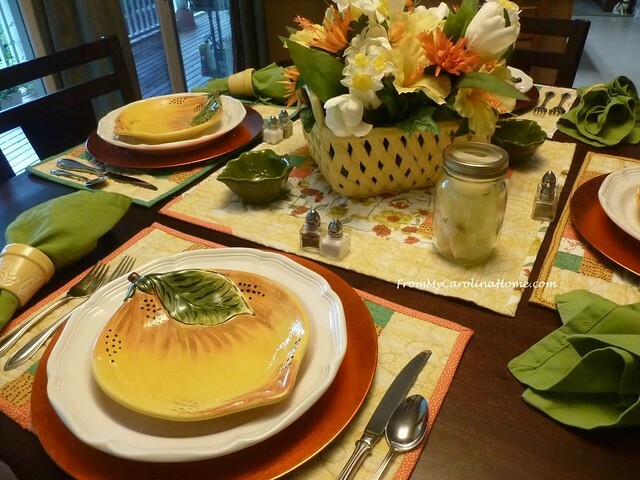 Hello Carole; Everything you did for this table setting is so pretty and just fits together perfectly! From all of the other comments, I am not the only one who thoroughly enjoys the way your talents work in designing your tables! I can not pick out one favorite item, only because each piece works so well with each other it is all perfect! Thank you so much for sharing and adding another vision of beauty into blogland today. Have a spectacular day, Carole! Beautiful tablescape! Those flower pot napkin rings are too cute! The bright colors make me happy! I can’t believe you just have all of this stuff in your house already!!! It looked beautiful and you certainly transformed some spring looking things into fall looking things :~). So lovely! I certainly do not have your talent for tablescaping. Lovely table! I really think those lemon plates are cute! A perfect blend of summer and early fall! Very lovely Carole! Lovely combinations—and actually pretty simple. I love when the settings are all designed to show the food off, also. 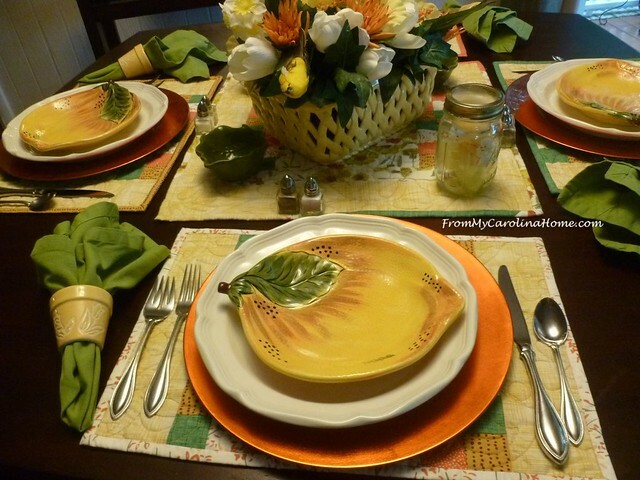 Carole, your golden-hued tablescape is just lovely! Thanks for sharing at Vintage Charm!